LIB 103 is a smart classroom with seating and computers for 28 students. It's perfect for providing opportunities for hands-on activities. LIB 101 is a smart classroom with seating for 24, but no computers for students. It's a great room to use for activities where you want students to engage one another on activities such as brainstorming, topic building, or group collaborations. Contact a librarian for information about instruction sessions at CTC. During the first week of the quarter and finals week, faculty may book LIB 103 or LIB 101 for their own use. For the rest of the term, contact a librarian 1-2 days before the needed time to see if the room is available. LIB 103 is not available for course evaluations. The purpose of the Reference & Instruction Department is to facilitate student learning and intellectual growth through scholarship, discovery, application, creativity, and critical thinking. Library faculty are available to collaborate with classroom faculty to design assignments and provide instruction for students in a variety of formats, both face-to-face and online. brief information about the assignment and outcomes for the instruction session. A librarian will get in touch with you to schedule the class. When a librarian has been assigned to meet with your class, he/she will contact you to work out specific details for class outcomes and activities. Please book your class session at least seven days in advance. This lead time provides the librarian an opportunity to collaborate with you and prepare a lesson that addresses the needed outcomes and activities for the instruction session. Also, the library classroom tends to fill up fast! Studies show that library instruction is more useful to students when it is linked to a specific assignment. Librarians can meet with you to discuss the assignment and content for the session. We limit the amount of content covered in order to provide opportunities for hands-on learning activities. Librarians are eager to collaborate with you to design assignments and instructions sessions that help students gain valuable information literacy skills. Plan to attend the session. Your presence allows for more interaction between the class and the librarian and improves the students' experience. It also allows you to provide feedback to the librarian to improve future sessions. 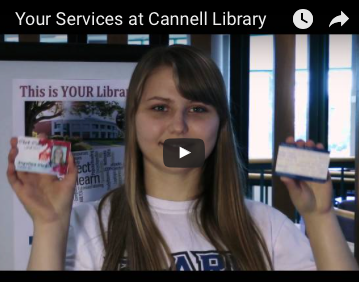 Visit the Library Tours & Videos guide to see all the options, which include both in-person and virtual tours and worksheets for both Cannell Library and the Information Commons @ CTC. Clark Librarians: log in to see the tab on this page for the English Policy and Curriculum Guide 2018-2019.